This cartoonist has some serious flaws. Either their ignorance or their willingness to lie is without practical limits. 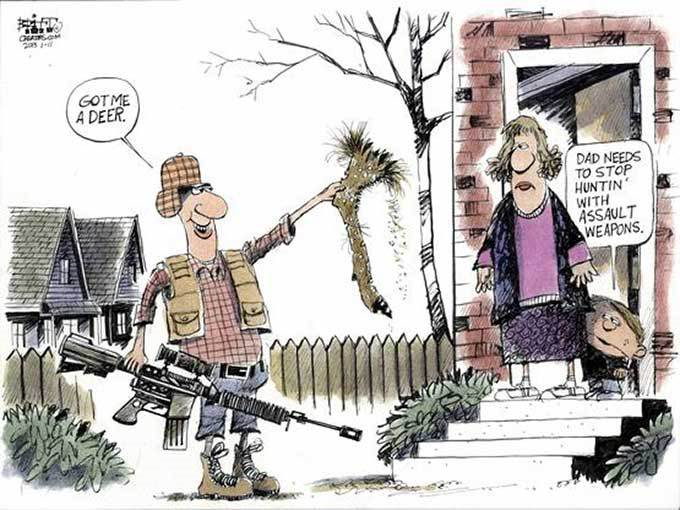 Furthermore the cartoon ignores the real purpose of this type of rifle and the Second Amendment. It’s not about hunting. George Washington didn’t cross the Delaware River to get to his duck blind. This entry was posted in Gun Cartoon by Joe. Bookmark the permalink. Never mind that a hunting caliber can be anywhere from 2 1/2 to 4 times more powerful. But they’ve been duped by that “high-powered assault rifle” BS. Seriously, the only way this cartoon “works” is if the intended audience is utterly ignorant of hunting or gun calibers (not to mention ignorant of how AWB’s define things or what the 2nd is about). Thus ignorance is an *asset*. Which is to be expected. The antis do better the more ignorant the people they’re talking to are about the subject at hand. What was the fatuous phrase in Nazi Germany? Kraft durch Freude (Strength through Joy). We all know joy is bliss and ignorance is bliss, so it is indeed, Strength through Ignorance (of the masses). There was also “Arbeit macht frei”, the best ever reminder why the right to bear arms is essential. Do you mean, a round from an AR, won’t cause the target to disintegrate? A couple years ago I was talking with friends who knew (and still know) next-to-nothing about guns, other than what the media spews. One said that banning ARs would be OK, because nobody needs a “high-powered weapon” like that. I casually held up my thumb and forefinger a bit less than a quarter-inch apart and said, “The bullet it fires is that big. It’s not ‘high-powered’ by any means.” Her eyes got REALLY big, and she got a contemplative look on her face for a while. We weren’t visiting long enough to make any big changes to the mindset, but I think I got through on that point, at least. 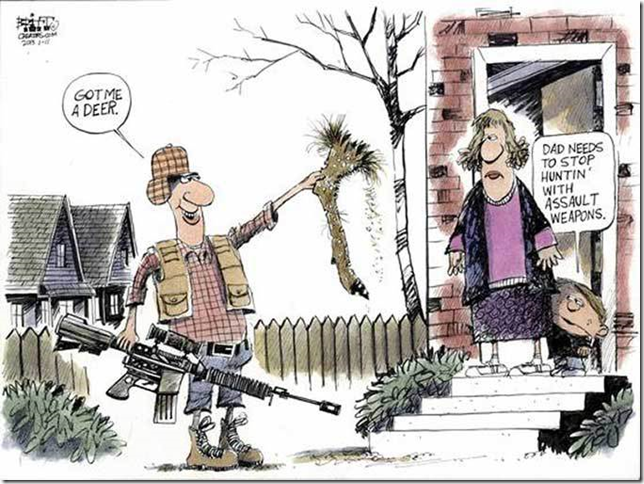 The cartoon also misses the mark in Washington (and possibly other states), in that the minimum caliber allowed for deer hunting is .24, making most AR style rifles insufficient at .223/5.56. You can hunt cougar with your center-fire 22. It’s also illegal to hunt with a full auto, or with a magazine holding more than five rounds. And of course it all ignores the issue of coming away with as much edible meat as possible. The cartoon is pure bigotry of course, right along the lines of the German cartoons of the 1930s depicting Jews as rats and so on. I’ll note also the kid hiding behind the woman, furthering the leftist theme of men being stupid, violent, dangerous, inconsiderate louts while the women are the ones with the common sense and intelligence. This cartoon also ignores the fact that, strictly speaking, bolt-action rifles, lever-action rifles, and black-powder rifles and muskets, while pretty much just used for hunting today, were all “assault weapons” at one time or another. And I forgot to mention longbows, which were so effectively used by Great Britian in their various wars of that day. Not to worry, all those are on the list to be banned next. Interesting quote. Do you have a source for it? To me it embodies her mindset but I don’t want to spread it around if it’s not verifiable. Some searching turns up references to an interview on Good Morning America, Dec 10, 1993, but I’m not having much luck finding an online vide of that. A recent “Non Sequitur” cartoon had the same theme. I tweeted about it here. “As civil rulers, not having their duty to the people duly before them, may attempt to tyrannize, and as the military forces which must be occasionally raised to defend our country, might pervert their power to the injury of their fellow-citizens, the people are confirmed by the next article in their right to keep and bear their private arms.” — Tench Coxe (1755-1824), writing as “A Pennsylvanian,” in “Remarks On The First Part Of The Amendments To The Federal Constitution,” in the Philadelphia Federal Gazette, June 18, 1789.